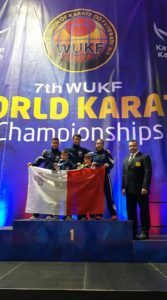 SKSM team Honours Malta once again! 3 medals – Gold, Silver and Bronze were earned in the World Championships held in Dundee. Mr Chris Galea and the 2 coaches Andrew Galea and Amber Camilleri pose on the podium with their athletes Andrea Saliba ,Rowan Saliba and Zack Pace Cauchi. Hard work pays off! Well done SKSM!